You can even choose the ‘Detect Edges’ option so that Aperture can find any hard edges in your shot, helping limit your adjustment to a specific area. Brushes will give Photoshop a run for its money. If you’re working with multiple computers, there’s the new ability to split and merge libraries, making it easy for you to take a subset of your photos out, make additions and adjustments to them and sync them to the main library when you get home. With image sizes getting so large these days, this is actually a godsend when working in the field. Depending on how you work, you may need to create multiple libraries and switch between them. Prior to version 3, this would have required a complicated library-opening process. Now there’s a much quicker way to move between libraries, by using the File > Switch to Library command. Despite all of these improvements, there’s a potential glitch: users report problems upgrading libraries from previous versions. The process appears to freeze or take hours, sometimes even days. Upgrading from version 2 was trouble-free for us and, we gather, for the vast majority of users, but if you’re at all concerned, you should make sure you have a backup copy of your original library at hand. 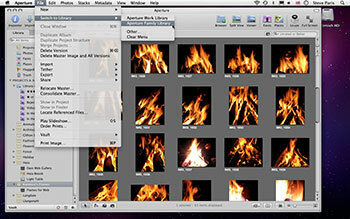 A lot has changed in this version of Aperture, but it’s all the better for it. The improved Raw engine, updated sorting options, more powerful search features, more versatile adjustment tools, and more, mean that if you own version 2, you should seriously consider upgrading. You’ve always been able to manually adjust an image’s settings, but Aperture 3 offers new presets to help you alter a photo quickly and easily. You can choose from a number of bundled presets but also have the ability of creating some of your own: use any of the adjustment tools available to you and gather them all in a bundle which you can access from that pop-up menu at any time (you can even create new folders within that menu to further sort your custom presets if you like). The nice touch is that you don’t have to select them to see how those adjustments will affect your image: hold the cursor over one of them for a few seconds and a thumbnail will appear, offering you a quick preview of the outcome. These presets aren’t trapped within your copy of Aperture either: you can export them and import new ones straight from the ‘Edit Presets’ window.